Whether it’s on the field or in the sky, Abby Wambach has shown us she can soar to new heights. The Olympic champion of the U.S. women’s national soccer team flew in an F-15 while visiting the Montana Air National Guard on Sept. 11. “Tomorrow is the big day. Flight is at 9 a.m. Mostly excited about the F-15, but also a little terrified. Yikes,” she tweeted the night before. Wambach began her visit to the Great Falls International Airport, Mont., on Sept. 8, to get briefed for her Sept. 11 anniversary flight. Wambach was also there to speak with the airmen of the 120th Fighter Wing who work at the airport. Maj. Cody Smith, a 120th public affairs officer, said Wambach was a great inspiration and spoke to the airmen about promoting diversity, encouragement, empowerment of women in the military and of women all over the world. “There was a distinct purpose, a multitude, for her visit, including promoting teamwork and fitness, which members of the military can understand,” he said. Tech. Sgt Tammy Wajer, the first woman to be hired in the maintenance operations center for the 120th, saw similarities between Wambach and women in the service. “I think she’s very passionate at what she does, and I think I can speak for all the women of the 120th that we love what we do and if we didn’t, we wouldn’t be here,” she said in an interview with TV station KRTV. “Couldn’t be more proud to take this flight on 9/11 anniversary. Hats off to those who lost their lives and those who serve now to protect ours,” Wambach tweeted, followed by more tweets with photos of her in the plane. Wambach took the back seat for the 50-minute sortie and watched as the pilot conducted training in basic fighter maneuvers, Smith said. 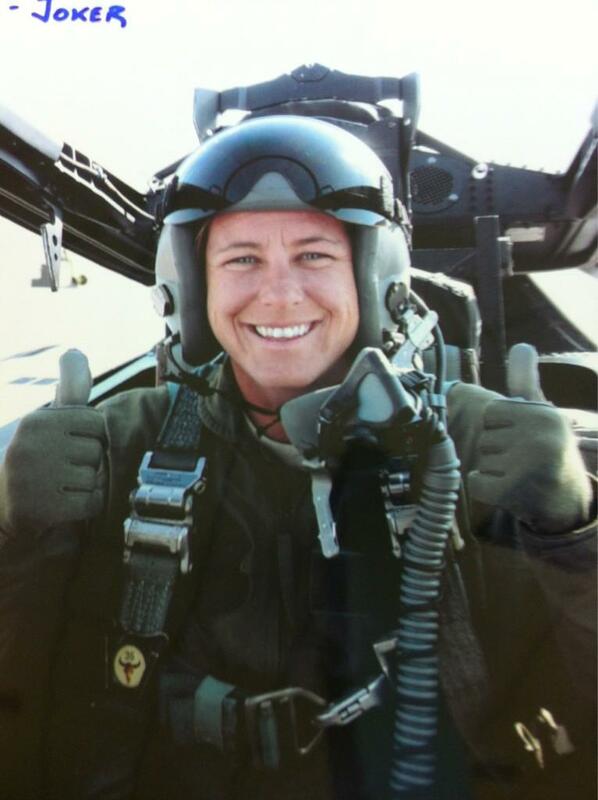 “She was in the back seat, flying with Lt. Col. Larry Gardner, and she got to see some of the physical demands it takes to be a fighter pilot,” Smith said. “I can’t believe that men and women around our country get to do that for a job, I thought that I had the coolest job in the world, I think that maybe I’m reconsidering, I mean, it was amazing,” she said. While in Montana, Wambach hosted a soccer camp with the kids of Get Fit Great Falls, a health and wellness organization, and worked to educate residents about the importance of maintaining physical fitness. She said she chose to come to Great Falls because she liked that it was a smaller city in a largely rural state, the Great Falls Tribune reported. Wambach praised military members for all their efforts. “This is just the responsibility factor, when it comes to being able to travel the country, and perform and compete for my country, I need to reach out and thank those who allow me to have that chance and freedom to do so,” she said in an interview with KRTV. The Olympic champion said she was thankful for her visit and her experience with the 120th. “Unbelievable commitment by the air force and all our service men and women all over the world. Thank you” and “Best thing I’ve EVER done. Thank you endlessly. #missedmycalling” she tweeted. View Abby’s tweets from her flight on her twitter page.